Doors op en 7.30 pm Concert 8pm. The Sound Of BlueNote has performed all over the southwest, including main stage gigs at Swanage, Lyme Regis and Bournemouth jazz festivals, numerous club gigs at venues such as the Blue Vanguard in Exeter, Sound Cellar in Poole, Southampton, Chichester and Portsmouth Jazz Clubs, The BeBop Club and the Future Inn in Bristol as well as Pizza Express Soho, Boisdale Of Canary Wharf, The Bulls Head Barnes and The Half Moon in Putney and more. The core of the band is the classic quintet format – tenor sax, trumpet, piano, bass and drums. 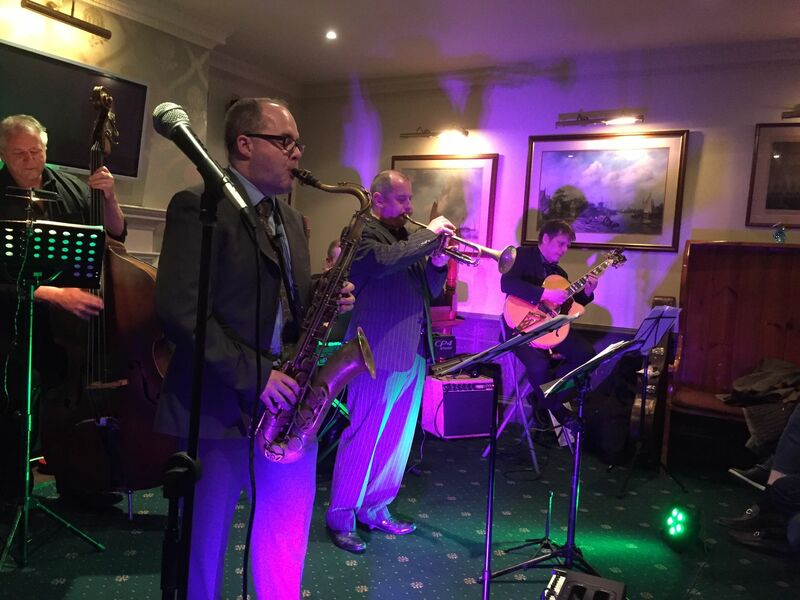 We’ve also had considerable success when we feature a guest instrumentalist, and have expanded the repertoire to include guitar, trombone, vibraphone, vocals or an additional additional saxophone. Some of our guests have included Nigel Price, Alan Barnes, Mark Nightingale, Gilad Atzmon, Dave O’Higgins, Jim Mullen, Orphy Robinson and Ian Shaw. “There is a bunch of talented guys in the south, who are revelling in their faithful reproduction of some of the more rare 50’s & 60’s recordings. They sound great, they play great, and damn it they look great too. This classy act pays an unashamed homage to some of the giants of yesteryear, such as, Stanley Turrentine, Lee Morgan and Hank Mobley, and they do it very well indeed. Canadian sax man Terry Quinney and trumpeter Andy Urquhart deftly deliver intrigue and soulful lines in remarkably tidy unison and then dazzle with their virtuosic improvisations, all the while driven by top flight rhythm section.